How do I email out using Microsoft Outlook? This tutorial will show you how to set your system up to email out using Microsoft Outlook. 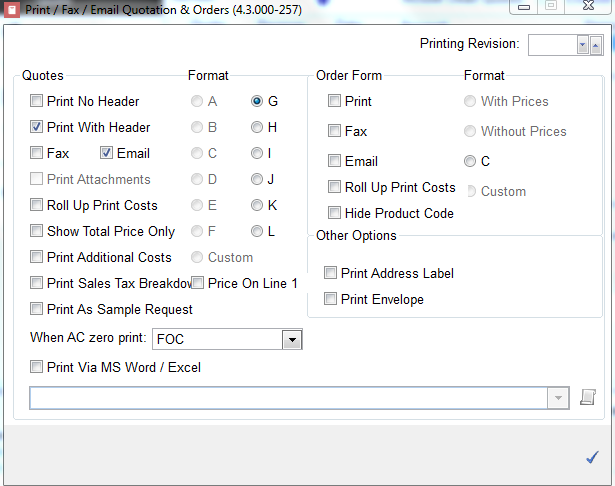 Whenever you choose to print a document within PromoServe, you will see a checkbox called 'Email'. Check this box on the Print Options screen then left click the blue check at the bottom right corner to continue. The first time you choose to email from the software, this screen will be displayed. Left click on the 'Emailer' dropdown and select 'Outlook' from the list. Tick the 'Save as Default' checkbox. Left click the email button at the bottom left of the screen. Microsoft Outlook will now be launched and will display the new email screen, ready for you to send the email.